David Wright swung on a 3-0 count with the bases loaded in the bottom of the ninth, lining a fastball to right-center for a walkoff 5-4 win. Curtis Granderson ambushed a mistake fastball right down the middle for a leadoff home run. Two batters later, Michael Conforto lined a ball to right field, spinning Ramon Flores around and going past his glove for a double. Brewers pitcher Zach Davies came into the game as a below replacement pitcher (-0.1 WARP) and it looked like he would be the perfect remedy for the Mets recent offensive woes. Instead, Davies struck out Yoenis Cespedes and Neil Walker to get out of the jam. Davies kept the Mets off the basepaths until Cespedes singled to right on his second at-bat. Cespedes advanced on a curveball in the dirt and then scored on a Asdrubal Cabrera single. David Wright led off the sixth inning by taking a fastball just outside for strike three, shortly after which hitting coach Kevin Long was ejected for arguing from the dugout. Conforto walked to bring Cespedes up as the tying run. Cespedes was out in front of a 2-2 changeup but strong enough to pull it down the line and over the wall for a game-tying homer. Blaine Boyer came in for Milwaukee and poured more gas on the fire. 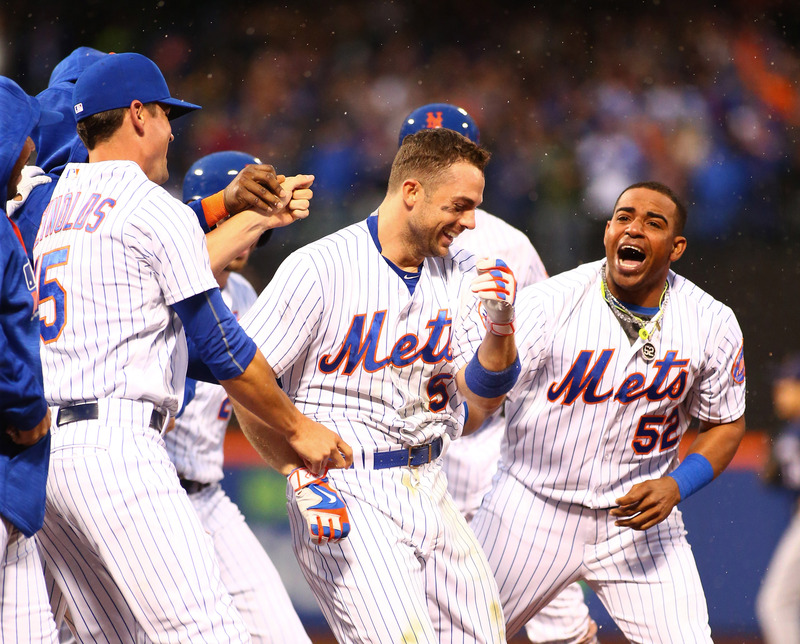 With two on and two out, Kevin Plawecki grounded out weakly to third, ending the Mets threat. Jacob deGrom had the lowest fastball velocity of his big league career during his last start in Colorado and Gary Cohen was immediately looking to the radar gun on Saturday. The good news is deGrom had his highest average fastball velocity of 2016, according to Brooks Baseball. deGrom got a total of 19 swings and misses, but unfortunately missed with a number of pitches right down the center of the plate instead of getting them outside. Ramon Flores pulled a mistake deep to right-center for his first career major league home run, giving the Brewers a 2-1 lead in the third. deGrom walked Aaron Hill to lead off the fourth, then hung a pitch to Alex Presley for a single, sending Hill to third. Flores hit a sacrifice fly, Davies dropped a sacrifice bunt, deGrom advanced the runners on a wild pitch and Jonathan Villar hit a broken bat single for the Brewers’ fourth run. deGrom was able to avoid more trouble in the fifth but his game, overall, had encouraging and worrying signs. deGrom set a season high with seven strikeouts but he needed 100 pitches to get through five innings and he allowed four runs. Hansel Robles came on in the sixth and pitched two strong innings while Cespedes tied the game up. Addison Reed pitched the eighth, retiring Chris Carter and former Met Kirk Nieuwenhuis before Hill singled and Presley walked after falling behind 0-2. Reed struck out Ramon Flores in a nine-pitch at-bat to end the threat. After the Mets went down 1-2-3 in the bottom of the inning, Jeurys Familia came in to the tie game to pitch the top of the ninth. Villar doubled off the left center field wall with one out. Cespedes took an odd route to the bouncing ball, but Villar respected his arm too much to try for third. His first baserunning blunder bailed the Mets out: Cespedes’ throw was well past the bag and David Wright had to – and, more importantly, was able to – make a leaping grab to keep the ball from going to the wall. Scooter Gennett came up next and grounded straight to Cabrera. Villar broke for third on contact and was thrown out easily. Jonathan Lucroy popped out to end the threat. The Mets sent the bottom of their order up in the ninth against breaking ball specialist Michael Blazek. Eric Campbell – filling in for Lucas Duda – bounced a bad hop single past Gennett. The Mets asked Plawecki to bunt after three weak at-bats, but he pulled back from a series of offspeed pitches. Terry Collins let him swing with two strikes and he drew a walk. Matt Reynolds came up for Familia as a pinch bunter. After fouling off the first two attempts, Campbell broke for third and Reynolds dropped a perfect bunt towards the pitcher. The Brewers walked Granderson intentionally to try and set up a double play. As the rain picked up, Blazek threw two balls and then threw a fastball well outside the zone. Wright looked for another fastball on 3-0 and lined it to right-center to win the game, the Mets’ first walkoff homer since Wilmer Flores’ “crying” game on July 31, 2015. Duda was scratched around an hour before game time due to a back issue. He had an MRI but Collins said “it’s too early to tell” how long he would be out. Duda missed Tuesday and Wednesday after receiving an anti-inflammatory shot for his back. The Mets have a history of trying short-term measures to avoid putting players on the disabled list, so we’ll see how they handle Duda. Wilmer Flores worked in spring training to be Duda’s backup, but he is on the DL until Friday at the earliest. Alejandro de Aza has reportedly been practicing at first base, but the 32-year-old has never played infield in his professional career. Expect to see more of Campbell at first next week. The Mets look to sweep the Brewers with Noah Syndergaard on the mound.